The clock ticks toward the 2014 draft and every Dolphin fan chews stubby fingernails waiting for the inevitable “Ted F-ing Ginn” moment. Remembering where you were when the commissioner stepped to the podium and announced, “With the 9th pick in the 2007 draft, the Miami Dolphins select… Ted Ginn Jr from The Ohio State University” is a rite-of-passage for Dolphin fans. Man landing on the moon has nothing on the “Ted F-ing Ginn” moment! Typical of every year since Dan Marino retired, there were no QBs available when Miami’s turn came to pick. JaMarcus Russell and Brady Quinn were the first round busts that year, followed by Kevin Kolb and our own beloved whipping boy, John Beck in the second round. Not one QB from that draft class ever made an impact in the NFL. Yet we remember “Ted F-ing Ginn” for the shear absurdity of selecting a kick returner in the first round. Poor Malcolm Cameron never had a chance at, “failing forward fast.” He was just a very unlikable character in a place jaded from a fall off the pinnacle of the league when The Don passed into lore and Jimmy Johnson quit. In 2014 a new GM and embattled 2nd year coach pace the war room in fear of the “Ted F-ing Ginn” moment. Hoping with bloody cuticles, they can ride a tide of some strange force of luck and wash away the curse of “Ted F-ing Ginn” and the entire Ginn family. Isn’t it strange how life can be so cruel, “Ted F-ing Ginn” was never a bad fellow. He didn't beg the commissioner to call his name with the 9th selection of the 2007 draft. It should have been the greatest day of his life, a day he had prepared for since grammar school and yet, upon his introduction boos echoed through Miami like thunder rolling off the Atlantic Ocean. The coach who selected him was vilified and the GM ostracized, both faced the firing squad after a 1-15 season. The question Dennis Hickey must ask himself is, how can I avoid a “Ted F-ing Ginn” moment? We often hear the term “best player available,” but does it really have a meaning when a team is picking 19th the draft? In 2007, Miami needed a QB and correctly assessed there were truly no quarterbacks worthy of the 9th pick. The team had no playmakers and decided “Ted F-ing Ginn” with 4.28 speed and impeccable family ties was not the stretch everyone else thought. They pulled the trigger and the rest is history. Perception is everything they say. The truth is, had the Dolphins selected Patrick Willis or Darrelle Revis with the 9th pick, we all may have fallen to our knees, but Randy Muller would still have a job in the NFL. Instead, he was left trying to remove the laces of Bill Parcells right shoe from his “Ted F-ing Ginn” selecting arse on the way out the door. Jeff Ireland had a formula that married need with the best player available. Somehow, that could not have been relevant when he traded one of his 2nd round picks to move up and select Dion Jordan. It remains to be seen, but many still believe Jordan was the best defensive player available with a couple glaring flaws, he was injured and by rule could not participate in OTAs until his college class graduated. For all of his shortcomings, Ireland was a man of conviction, he drafted Jonathan Martin to be a left tackle and passed on Lane Johnson even after Jake Long signed with the Saint Louis Rams. He could never have predicted the locker room fiasco that followed, but he was the man who paid the price for it. Had he selected Johnson, he might still be the GM in Miami. As the best defensive player available in the entire draft, Jordan is certainly not a “Ted F-ing Ginn” selection, yet somehow picking the BPA led to the same result, another GM licking his wounds in the unemployment line. Dennis Hickey probably practices yoga so he can get at his toenails since there is nothing left on his hands but bloody nubs. Selecting the best player available is not a panacea and reaching for a need is a bad plan, so it all turns out to be a mystery. There is no magic formula. Dennis hickey need only practice the art of throwing darts to change the fortunes of the Miami Dolphins on draft day. 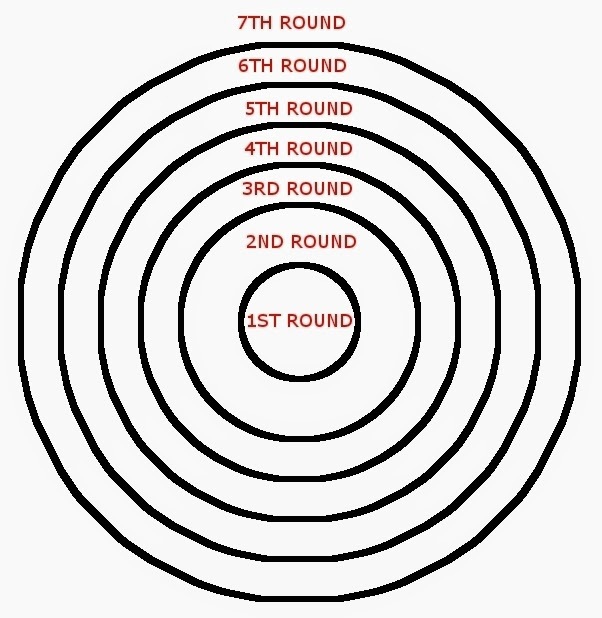 Prospective players are matched to a round in the draft using the example below. Color code the names on the draft-board to match an equally colored section on the dartboard for each round. The chances of striking it lucky are greatly increased. How you may ask, this seems like a random display of luck and yet isn’t that what the draft truly is? The chances of selecting a “Ted F-ing Ginn” are as good as selecting a Tom Brady but our perception clouds the ability to reason. A tackle becomes better than a safety because we need a tackle. Since the names will fall somewhat in the proper round based on the research of the scouting department, the rest is pure luck. Throw a decent dart and Walla, we match the luck of the draft with the luck of the throw! Sorry Dennis Hickey, this is all I got for you, if “Ted F-ing Ginn” falls in your lap you’ll be a failure. If Tom Brady somehow appears, you’ll be a genius. 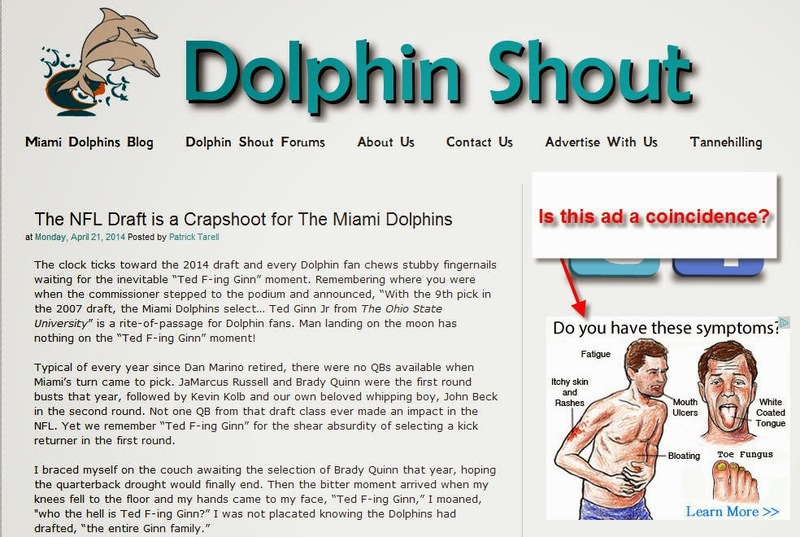 My brother sent me this picture of the ad on the shout graphically depicting the "Ted F-ing Ginn" moment! Maybe Dennis Hickey should stay away from his toenails!!! Tags: AFC East, Dennis Hickey, Jeff Ireland, Joe Philbin. Cam Cameron, Miami Dolphins, NFL, Patrick Tarell, Randy Muller, Ted Ginn Jr.